In July 2013, US EPA published a final rule which exempted launderable (reusable) and some disposable wipes containing solvent ("Solvent-Contaminated Wipes" or SCW) from regulation as solid wastes and as hazardous waste. Solvent wipes are very common waste streams generated by a broad range of industrial, commercial, service and institutional sector facilities. This rule streamlined management of this waste stream and allowed these materials to be stored, transported* and cleaned/disposed of outside of the hazardous waste rules that would otherwise apply. This provides a benefit to both facilities that generate these wipes and companies that handle them. * Although the rule exempts transporters from hazardous waste rules, Federal and State DOT HazMat rules still apply. Click here for more information on the Federal Solvent Contaminated Wipe Rule. 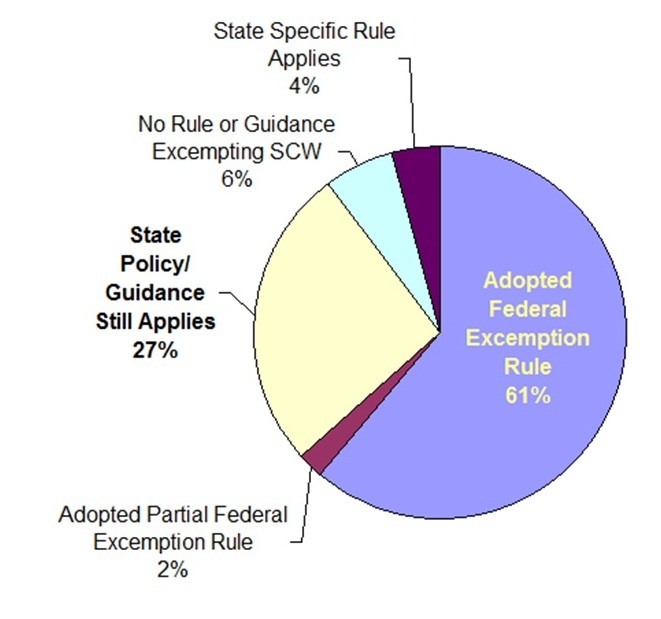 Although the Federal rule became effective on January 31, 2014, in majority of States the Federal exemption does not apply until State Rules were revised to include this exemption. In many cases, States had operated for many years under policies or guidance which functionally excluded these wipes from regulation as hazardous waste until a Federal Rule was finalized. With the publication of the Federal Rule in 2013, States needed to update State rules to reflect this exemption, if they wanted to allow generators to take advantage of it. Because this rule change was less stringent than existing hazardous waste rules, States were not required to accept the Federal exemption and could require generators to handle these wipes as hazardous waste. As of March 2017, 61% of State agencies have updated State rules to exempt solvent wipes, with most using Federal language or Federal language with very minor edits. One State (Rhode Island) implemented a rule that exempted reusable wipes only. As of March 2017, almost 1/3 of States have not revised State rules to reflect the SCW exemption and are still operating under policies or guidance documents written 10 to 15 years ago. In most cases, this policy or guidance is similar to the Federal Rule, but typically less specific and less stringent. Currently, many of these States are still planning to update State rules in the near future and are allowing generators to follow the Federal rule. Maine and Hawaii both anticipate having a rule revision in 2017. Two States, California and Minnesota, have rules (California) or policies (Minnesota) that are significantly different than the Federal Rule and do not plan to revise them. In California, the Reusable Soiled Textile Rule excludes all hazardous waste (not just solvent) on a wider range of textiles (not just wipes). In Minnesota, guidance exempts some wipes ("sorbents") but wipes containing certain listed solvents ("toxic solvents") remain hazardous waste and also must be included in their monthly calculation of the generator size.